My excitement has caused me to wake up before dawn on a Monday morning. After months of meetings, training sessions, phone calls, rallies, social media posts and paperwork, I soon will board a bus from Evanston to Springfield, Illinois. 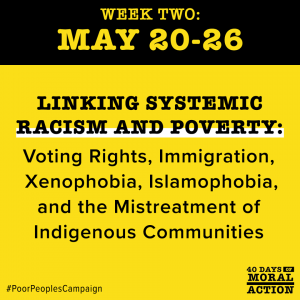 It is the second week of an intensive six weeks leading up to the launch of the revived, reignited Poor Peoples Campaign: A National Call for Moral Revival. 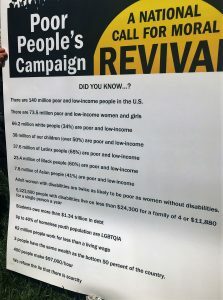 Last week, the 40 Days of Nonviolent Moral Fusion Direct Action began with a rallies and demonstrations in 39 states and the District of Columbia focused on Somebody’s Hurting Our People: Child Poverty, Women and People with Disabilities. National campaign co-chairs the Revs. William J. Barber II and Liz Theoharis were among hundreds arrested nationwide in the most expansive wave of nonviolent civil disobedience in U.S. history, kicking off six weeks of direct action demanding new programs to fight systemic poverty and racism, immediate attention to ecological devastation and measures to curb militarism and the war economy. 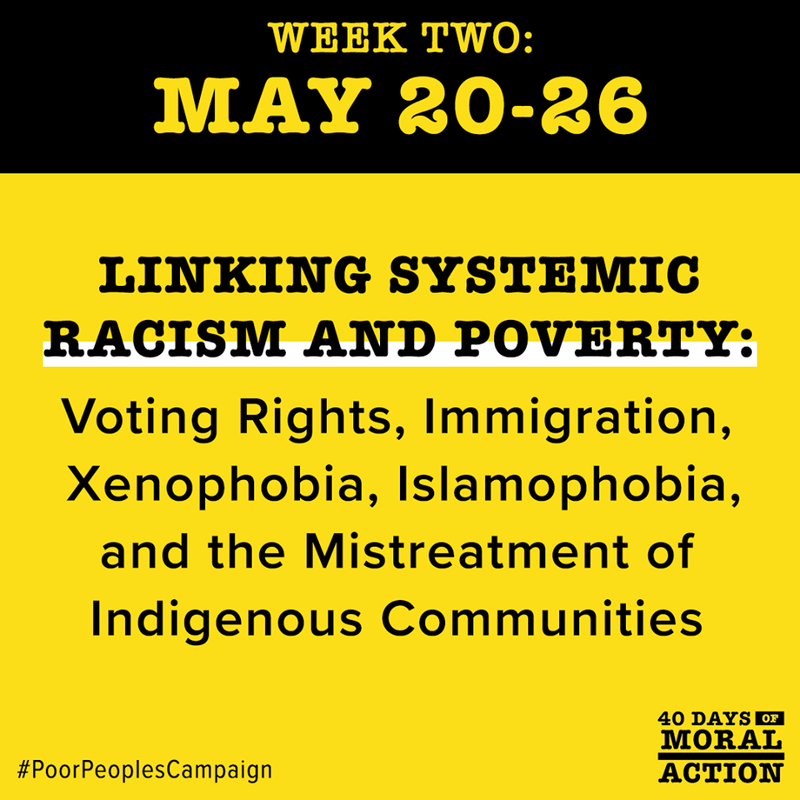 Today, our focus is on the connection between Systemic Racism, Poverty and Voter Suppression. We will visit our legislators to demand an end to racist gerrymandering and a reversal of state laws that prevent municipalities from raising minimum wages. Just days after our President referred to undocumented immigrants as “animals” who “aren’t people,” our protest will also demand a clear and just immigration system that strengthens our democracy and provides a timely citizenship process that guarantees the right to vote. We have been asked to accompany and be witnesses for the Illinois Fight for 15 coalition – the leaders of today’s nonviolent moral fusion direct action. One of our principles is always to follow the lead of those who are most affected. Another covenant reminds us that our political, economic and moral movement is not from above, but from below – building up the power of people and state-based movements. Two years ago, I was invited by my colleague, now my pastor, Rev. Daniel Ruen, to participate in the Moral Mondays protests focu sed upon changing Illinois’ unjust tax structure in order to allow for a people- and planet-first state budget. After two arrests, multiple Kingian nonviolence training sessions, and significant faith-based community organizing efforts, I am more convinced that ever that this is a critical time for people of faith to put their bodies on the line for their neighbors in need. The PPC is a natural progression made even more necessary by the increasing incidents in racism, homophobia, xenophobia, gun violence/militarism, ecological destruction, wage disparities and white nationalism – often promoted by religious extremists. It has been an honor to support Rev. Ruen’s leadership, my fellow Grace Lutheran members and Evanston’s interfaith community members in preparing trained, passionate and creative folks to join this movement in whatever way they are called by the Holy Spirit. I am grateful to be able to continue in the covenant God made with me in Holy Baptism which includes discipleship that “strive[s] for justice and peace in all the earth.” Like the on-going nature of discipleship, this is not just a finite moment. The PPC is a long-term, creative, non-partisan, nonviolent movement of faithful people intentionally opening themselves to God’s will done on earth as in heaven. Won’t you join us? It is my prayer that you will gladly share with your children and your grandchildren that you did!